Currency hedging strategies and their role in portfolio management have been studied extensively by researchers and practitioners alike. Fully hedging, optimal hedging, or even not hedging currency risk at all have been considered as ways to reduce the risk of international portfolios. But underlying all these is the assumption that currency risk represents risk without return. This logic is commonly justified by the fact that, over the long term, currency pairs such as USD/JPY produce only minimal returns. Thus, investing in currencies, eg 10% in the yen, would not be expected to raise a portfolio’s Sharpe ratio. Even so, this does not necessarily rule out that investors could benefit from style-based currency strategies such as a carry trade. For example, systematically overweighting currencies with high interest rates and underweighting currencies with low interest rates might be beneficial in a portfolio context. Our study takes a comprehensive look at the most popular foreign exchange investment styles over the period from January 1985 to December 2009. In addition to the carry trade strategy, we investigate investment styles such as foreign exchange momentum strategies and foreign exchange value strategies. Our simple FX style composite strategy combines all three FX styles in equal proportion. We then use traditional mean-variance spanning tests and recently proposed multivariate stochastic dominance tests to assess portfolio investment opportunities from foreign exchange investment styles. 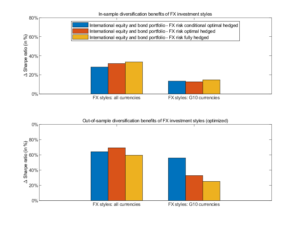 We find that FX investment styles can add statistically significant and economically meaningful performance improvements. An internationally oriented stock and bond portfolio augmented with foreign exchange investment styles could generate returns per unit of risk that were almost a third higher over the sample period. The diversification benefits persist even after accounting for transaction costs due to rebalancing the style-based portfolios, and they hold when portfolio allocation is assessed in an out-of-sample framework.